If you were a Faculty180 users before release you will notice substantial differences. You may find our document on the Spring 2018 changes useful in familiarizing yourself with all differences. For Users Familiar with Pre-March 2018 Interfolio. If the image below is not what you see after signing in, you may be at your Interfolio Dossier. You should select your name in the top-right corner and select the desired Institutional Account. After logging in, and choosing an institutional account, users will see the page that's displayed below. The navigation bar options will vary depending on their permissions and Interfolio products used by the institution. The Interfolio homepage for institutions is the central place for faculty members within interfolio, no matter what product they use. Relevant action items will be displayed organized in the tables below (more later). Quicklinks have moved from the homepage, click here to learn how to use Quicklinks. Zoom: The Quicklinks button is no longer at the top of the homepage, you must select a Faculty180 page to use it, such as Announcements and Help. The institutional announcements tool, institutional help, and institutional FAQ have been moved to their own page on the Announcement's & Help Page. There users can access all Faculty180 resources provided by their institution. The search colleague tool has been moved from the Homepage to the Navigation bar, as displayed below. Click here to read more about the Search Colleague tool. 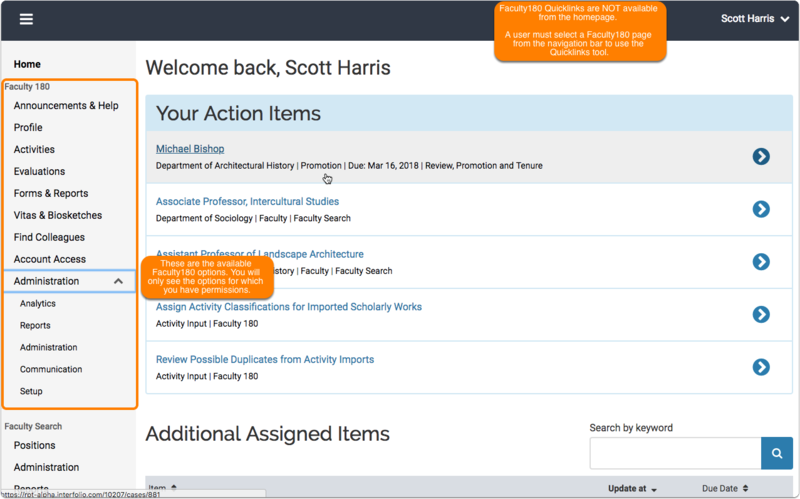 The Action Item section displays a list of tasks that need to be performed, such as completing an input form or an evaluation and accepting a co-authored work. In addition, messages that have been generated and sent to you by administrators at your institution also display here. To view the details related to a task or message, simply click the item. Messages can be deleted by clicking the Delete (X) icon (As of March 30, 2018, this feature has been temporarily removed, and we be re-added to the homepage at a later date). Only relevant options will be displayed. Branding Settings are only available to level 1, Institutional Administrators at an institution. A personal Dossier account associated with the same e-mail address that is associated with the institutional Interfolio (Faculty180, Review, Promotion, & Tenure, or Faculty Search) account. A Dossier Institution account provided by their institution. 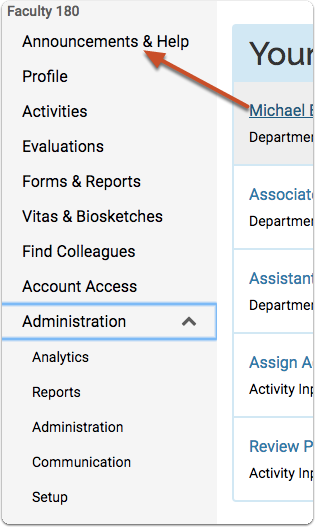 If a user has multiple administrative privileges, they will have another option to change their permission sets. This will ONLY be available from a Faculty180 specific page, similar to Quicklinks. 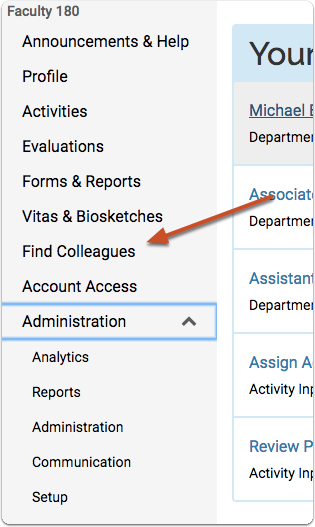 It also is accessible via the Tools section of the Administrator page in the Admin section of the navigation bar. Click the Product Help link in the upper-right corner of the screen to access the Interfolio Knowledge Database. 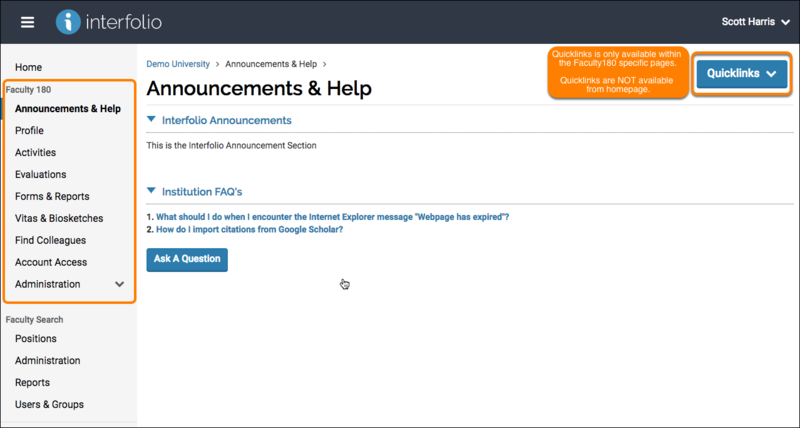 Users can also submit support tickets to Interfolio if assistance with FACULTY180 is needed. The home page is for the Knowledge Base is product-help.interfolio.com. Note that many institutions request that faculty members submit tickets to administrators at your institution. 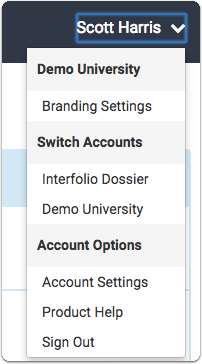 The Account Settings page allows a user to view the Interfolio account Settings. Please note that these are personal account settings are are not associated with your institution and are set only be the account user.